Thank you for your interest in Cincom Smalltalk. We’re pleased to offer the current PUL versions of Cincom® ObjectStudio® 8.9 and Cincom® VisualWorks® 8.3 for your personal use. Maintenance releases of Cincom Smalltalk are available to current customers. If you are interested in receiving the maintenance releases, download your license here. Please note that the download versions of ObjectStudio and VisualWorks have a new license; the “Personal-Use” license. We feel this license fits the needs of the community, contributors, and citizen developers using Cincom Smalltalk products. The Cincom Smalltalk Community is important to Cincom, and we are pleased to let you know of this change to better support our community. 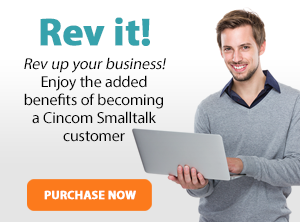 If you have product questions or suggestions, please contact Arden Thomas, the Cincom Smalltalk Product Manager. Should you require a different type of license or evaluation, please contact Suzanne Fortman, the Cincom Smalltalk Program Director. If you are an Academic User, you can get full support by emailing the Cincom Smalltalk Product Team. To receive your free, personal use copy of Cincom Smalltalk, simply fill in the form below with ACCURATE INFORMATION and the link will be emailed to you. NOTE: Due to governmental regulations, it may take up to 24 hours for approval. If after 24 hours you have not received the email with the direct download link, please contact the Cincom Smalltalk Product Team. Plan accordingly. *All fields but “Comments” are required. I understand and acknowledge that the software I am requesting to download is subject to export controls under the US Export Administration Regulations and that I may not export or re-export or re-distribute the software. I acknowledge that this software is not intended for use by a Government End-User as defined in Part 772 of the US Export Administration Regulations.